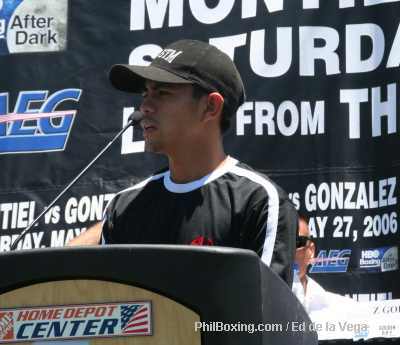 Being my day off, I was just lounging at my back yard pool sipping ice-cold lemonade when Sam Gello-ani called up and informed me that the Press Con for the Montiel/Gonzales fight wherein our very own Z Gorres will fight in an undercard, will be held at high noon today at the Home Depot Center. So, I rushed to take a shower, put on my "Media Outfit", grabbed my camera and took off for Carson City, a good 1 hour drive from my house. A boxing ring was installed at the Home Depot Center In Carson City where the Gorres fight will be held on Saturday. Top row: Z Gorres, Michael Aldeguer, Sammy Gello-ani and GBP Matchmaker Sampson Lewkowicz. 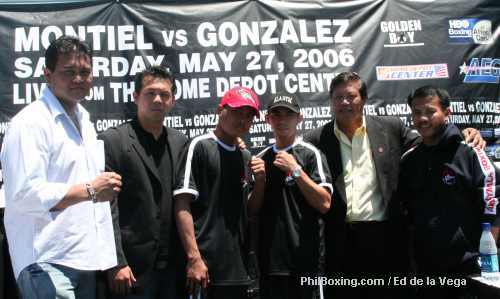 Bottom row: Johhny Gonzales and Miguel Angel Gonzales. I got to the place and the first person I saw was Eric Gomez, the Senior Vice President of Oscar de la Hoya's Golden Boy Promotions. He greeted me by saying "Hey my man, the pictures at Philboxing were great. I didn't know you write too." I just smiled and said thank you. We talked for a while and our conversation drifted from Boom Boom's success last weekend to the chances of Z Gorres on Saturday and to the incident about Barrera's mouthpiece as he fought Juarez last Saturday. "I will make sure you get introduced to Barrera today and his people so you can talk to them about getting him a new mouthpiece." Again, I said thank you and moved on to the press area. Z Gorres delivered a short speech at the podium. WBO Asia-Pacific boss Leon Panoncillo (left) poses with ALA Team Michael Aldeguer, Boom Boom Bautista, Z Gorres, Sammy Gello-ani and ALA Boxing Club Chief Trainer Edito Villamor. Golden Boy Promotions served a delicious Mexican food complete with all the trimmings for the press people to enjoy. A few minutes later, the ALA group came in and we all had lunch together. 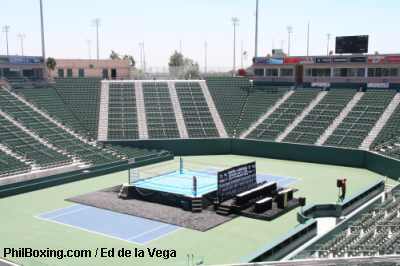 The Press Con was held outdoors at ringside amidst the temperate high noon sun in Southern California. 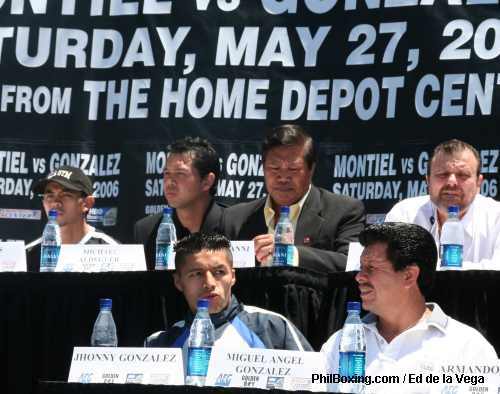 Of course it is all about Montiel and Gonzales and Barrera as the co-promoter. That is rightly so since they are in the main event. But, the undercard people were also given a few minutes of fame. When Gorres was introduced, I positioned myself better amongst the photographers so I can get some nice ones to share with the PhilBoxing fans. Gorres, being the soft spoken and shy person that he is, went straight to the point. 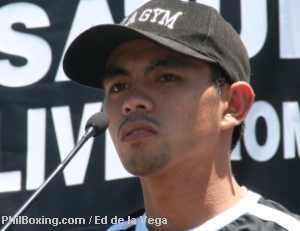 "I thank the Golden Boy Promotions for this opportunity. I will give a very good fight and bring honor to my country." With that short statement, he raised his hand and walked off from the podium. Gorres' opponent, for some reason or another was not present and nothing was mentioned publicly why he was not there. Since there was no question and answer session, the press in general never found out why. But, that did not seem to matter because the focus was on Montiel and Gonzales. After the Press Con, and as we all walked to the parking area, Gorres came to me and said "Sir, thank you for the new mouthguard. I intend to do well and make you proud of me."